For the price of Cool Imager II and III, click here..
For a list of chemiluminescence-related products, click here. For the User Manual of Cool Imager II and III, click here. Chemiluminescent and fluorescent imaging is used broadly for the study of proteins and DNA/RNA. Conventional imagers for imaging DNA gels cannot be used for detecting chemiluminescent signals due to their limited sensitivity. In order to detect chemiluminescent signals, CCD cameras must be cooled to a low temperature to reduce "Hot Spots". Cool ImagerTM - a chemiluminescent & fluorescent imaging workstation, developed by Viagene Biotech - is a compact, single integrated unit with state-of-the-art computer, microelectronics and semiconductor technology. It provides the capacity for rapid, high sensitivity capture of chemiluminescent and fluorescent images, which can be analyzed through pre-installed sophisticated “Cool Imaging" software. The combination of the Cool Imager’s high-integration and the deep-cooled CCD camera with focus-stabilized optics makes it possibly to achieve much better levels of sensitivity, dynamic range, linearity and resolution compared to other much more expensive imagers on the market. With Cool ImagerTM, all images are digital and one can completely eliminate the use of x-ray films and film developers for chemiluminescent imaging. Agarose gels stained with EthBr or SYBR Green. Acrylamide gels stained with Coomassie Blue, SYPRO Red, SYPRO Orange, and silver stain. Microplate assays, e.g. reporter gene assay. Cool Imager™ is an all-in-one unit and comes with all the hardware including the monitor, keyboard, mouse, pre-installed operating system and analytical software. After you receive the units, plug in and use; that is it. No custom hardware and software installation are required. The unit is integrated with the computer-board with an embedded CPU, the control board and operating panel, optical devises, a frame grabber, lights, filters and a mini darkroom chamber. This specific design increases efficiency and stability of the workstation. Low-noise technology is applied to all the electronic components in the unit to prevent the interruption of electro-noise and reduce vibration, which makes the design of highly integrated system possible and enhances the stability of the unit. Detects as little as ~0.5 fg (10-17g) of HRP with Lightgen™ substrates and completely eliminates the use of X-ray film for chemiluminescent imaging. Cool imager can integrate ~30 frames per second and collect ~50,000 frames in ~30min, and its sensitivity is better than autoradiography using radioisotope p32 or S35. The mini darkroom is light-proofed by a design with multi-staged, magnetic sealing strips, which permit the door to open and close easily. There is no external camera or lens outside of the unit. All electronic and optical components are enclosed inside the unit, which provides a moisture-proof, dust-proof environment and extend the service life of the electronic and optical components. 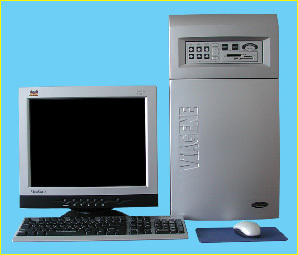 Workstation uses a flat control panel to turn on and off the operation program and also controls image capturing, light source, power lens and camera functions. With the software, ViaCapture, capturing an image is achieved simply by entering the number of integration. 1D gel, 2D dot-blot, bacterial colony, Western blots, DNA/RNA hybridization, EMSA and microplates can be imaged and saved by Cool Imager™. The captured images can be opened and edited with ViaAnalysis software. ViaAnalysis can invert, correct slanted images, adjust image contrast and brightness, perform image quantitation and more. All images can be copied, pasted or printed. Office, Image editor, PDF, Zip and Antivirus programs are pre-installed. The ultra-cooled, C-Mount camera with 2-stage Peltier cooling mechanism, cools temperature down to -45oC and reduces the background noise down to 17 e- rms. The cooled camera has an 8 bit, ½ inch CCD installed with a pixel size of 6.4um X 6.4um. The resolution can reach up to 1642H X 1024V. F=1:1.0, 8~48mm optical lens with power zoom, power focus and iris. A set of white reflective lights and 3 sets of colored reflective lights (Cold Light) are included. Transmitting blue, ultra-violet or white light boxes are sold separately at an additional cost. A tunable filter wheel which can hold 4 sets of filters. 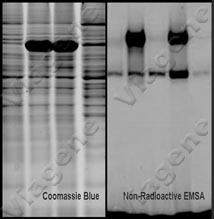 A brown filter is included for imaging DNA/RNA gels stained with Ethidium bromide or SYBR Green. Other filters are options sold separately at an additional cost.